How to Cite This Chapter: Caron F, Nowacki B, Anand S, Górecka D, Bała M. Nicotine Addiction. McMaster Textbook of Internal Medicine. Kraków: Medycyna Praktyczna. https://empendium.com/mcmtextbook/chapter/B31.II.3.23 Accessed April 23, 2019. Siu AL; U.S. Preventive Services Task Force. Behavioral and Pharmacotherapy Interventions for Tobacco Smoking Cessation in Adults, Including Pregnant Women: U.S. Preventive Services Task Force Recommendation Statement. Ann Intern Med. 2015 Oct 20;163(8):622-34. doi: 10.7326/M15-2023. PubMed PMID: 26389730. Leone FT, Carlsen KH, Folan P, et al; ATS Tobacco Action Committee; American Thoracic Society. An Official American Thoracic Society Research Statement: Current Understanding and Future Research Needs in Tobacco Control and Treatment. Am J Respir Crit Care Med. 2015 Aug 1;192(3):e22-41. doi: 10.1164/rccm.201506-1081ST. PubMed PMID: 26230245. Els C, Kunyk D, Selby P (eds). Disease interrupted. Tobacco reduction and cessation. Quebec: Les Presses de l’Université Laval; 2014. European Network for Smoking and Tobacco Prevention. European Smoking Cessation Guidelines. http://ensp.org/european-smoking-cessation-guidelines-and-quality-standards/. Published 2012. Accessed January 18, 2017. Canadian Action Network for the Advancement, Dissemination and Adoption of Practice-informed Tobacco Treatment. Canadian Smoking Cessation Clinical Practice Guideline. Toronto, Canada: Canadian Action Network for the Advancement, Dissemination and Adoption of Practice-informed Tobacco Treatment, Centre for Addiction and Mental Health. https://www.nicotinedependenceclinic.com/English/CANADAPTT/Guideline/Introduction.aspx. Published 2011. Accessed January 18, 2017. Tobacco Use and Dependence Guideline Panel. Treating Tobacco Use and Dependence: 2008 Update. Rockville (MD): US Department of Health and Human Services; 2008 May. Available from: https://www.ncbi.nlm.nih.gov/books/NBK63952/. U.S. Department of Health & Human Services. Tobacco. https://www.surgeongeneral.gov/priorities/tobacco/index.html. Accessed January 18, 2017. According to the World Health Organization (WHO), tobacco use is the leading cause of preventable death and disease in the world, resulting in almost 6 million deaths each year. Despite recent decreases in the prevalence of smoking in high-income countries, the vast majority of smokers live in middle- or low-income countries, where 50% of men and 9% of women smoke daily, the numbers are increasing, and approximately half of smokers die from a smoking-related cause. Health hazards of tobacco: Smoking reduces life expectancy by an average of 10 years.Evidence 1High Quality of Evidence (high confidence that we know true effects of the intervention). Doll R, Peto R, Boreham J, Sutherland I. Mortality in relation to smoking: 50 years' observations on male British doctors. BMJ. 2004 Jun 26;328(7455):1519. PubMed PMID: 15213107; PubMed Central PMCID: PMC437139. It is a major cause of cancer (Table 1) and respiratory disease, and a risk factor for osteoporosis and reproductive disorders. There is a clear dose-response relationship between smoking and risk of lung cancer.Evidence 2High Quality of Evidence (high confidence that we know true effects of the intervention). Carter BD, Abnet CC, Feskanich D, et al. Smoking and mortality--beyond established causes. N Engl J Med. 2015 Feb 12;372(7):631-40. doi: 10.1056/NEJMsa1407211. PubMed PMID: 25671255. Smoking also triples the odds of cardiovascular disease, and this risk increases linearly with the amount of cigarettes smoked.Evidence 3High Quality of Evidence (high confidence that we know true effects of the intervention). Teo KK, Ounpuu S, Hawken S, et al; INTERHEART Study Investigators. Tobacco use and risk of myocardial infarction in 52 countries in the INTERHEART study: a case-control study. Lancet. 2006 Aug 19;368(9536):647-58. PubMed PMID: 16920470. 1) Tobacco often taken in larger amounts or over a longer period than was intended. 2) Persistent desire or unsuccessful efforts to cut down or control tobacco use. 3) A great deal of time spent in activities necessary to obtain or use tobacco. 4) Presence of craving, or a strong desire or urge to use tobacco. 5) Recurrent tobacco use resulting in failure to fulfill major obligations at work, school, or home. 6) Continued tobacco use despite persistent or recurrent social or interpersonal problems caused or exacerbated by the effects of tobacco. 7) Important social, occupational, or recreational activities given up or reduced because of tobacco use. 8) Recurrent tobacco use in situations in which it is physically hazardous (eg, smoking in bed). 9) Continued tobacco use despite persistent or recurrent physical or psychological problems that are caused or exacerbated by tobacco use. 10) Tolerance, defined by either a need for markedly increased amounts of tobacco to achieve desired effects or markedly diminished effects with continued use of the same amount of tobacco. 11) Withdrawal, manifested by the presence of the characteristic tobacco abstinence syndrome (eg, 4 of the following: irritability, anxiety, difficulty concentrating, increased appetite, restlessness, dysphoric mood, insomnia) or tobacco (or nicotine) taken to relieve or avoid tobacco withdrawal symptoms. 1) Symptoms: Craving for nicotine, obsessive thoughts about smoking, anxiety, tension, difficulty in relaxing, nervousness (irritability or aggression), discomfort, frustration, depression or depressed mood, impaired concentration, sleep disorders, and increased appetite. 2) Signs: Bradycardia, hypotension, decreased blood levels of cortisol and catecholamines, memory impairment, selective attention disturbances, weight gain. Severity of dependence may be judged using a combination of several questions (Table 2). Patients can stop smoking by themselves, but evidence supports psychosocial and pharmacologic interventions to assist cessation. Assessment of tobacco use is an iterative process and can be brief and pragmatic (Figure 2). 1. When talking with the patient, clearly emphasize the most important health consequences of smoking, highlight the benefits of smoking cessation that are relevant to the patient (Table 3), and discuss potential difficulties in quitting and methods of coping with them (eg, discuss the symptoms and management of withdrawal). 2. Interventions should be positive and nonjudgmental. 3. Weight gain may be controlled by recommending adequate physical activity and a healthy diet. Exercise can also help to control cravings. Use of medication recommended for nicotine addiction in patients who have quit smoking delays but does not prevent weight gain. 4. Treatment modalities are selected on the basis of the patient’s readiness to cease smoking, individual characteristics and preferences of the patient, amount of time dedicated to the patient, level of nicotine dependence, qualifications of the doctor or nurse, and the cost of the interventions. 1. Ask the patient about his or her smoking status (current, former, never) and record it in the medical chart.Evidence 4Strong recommendation (benefits clearly outweigh downsides; right action for all or almost all patients). Moderate Quality of Evidence (moderate confidence that we know true effects of the intervention). Quality of Evidence lowered because a small number of studies are included in the meta-analysis and they were performed before the advent of pharmacologic therapy for smoking cessation. Fiore M. Treating tobacco use and dependence: 2008 update: Clinical practice guideline. Darby: Diane Publishing; 2008. 2. Advise the patient to quit smoking. Strengthen his or her motivation by referring to personal health, the health of household members, being a role model for smoking family members or colleagues, the economic cost of smoking, esthetic concerns, and self-control.Evidence 5Strong recommendation (benefits clearly outweigh downsides; right action for all or almost all patients). High Quality of Evidence (high confidence that we know true effects of the intervention). Stead LF, Buitrago D, Preciado N, Sanchez G, Hartmann-Boyce J, Lancaster T. Physician advice for smoking cessation. Cochrane Database Syst Rev. 2013 May 31;(5):CD000165. doi: 10.1002/14651858.CD000165.pub4. Review. PubMed PMID: 23728631. 1) How important it is for him or her to quit at this time. 2) How confident he or she is that it would be possible to quit at this time. 3) How ready he or she is to quit. Identifying the stage of change can help in adapting the interventions (Table 4). 1) Would you like to be a nontobacco user? 2) Do you think you have a chance of quitting successfully? If responding with “no” to any of the questions or “unsure” to the first question, the patient is not ready to quit and needs additional interventions aimed at increasing his or her motivation to quit. In such patients, a brief motivational intervention called 5 R’s can be used. The 5 elements addressed in this intervention are relevance (how quitting smoking is personally relevant), risks (what are the negative consequences of smoking relevant for the patient), rewards (what are the benefits of quitting smoking), roadblocks (what are the barriers to quitting and how they can be solved), and repetition (should be repeated at every visit of a patient not ready to quit). 1) Schedule multiple (4 or more) short (1-3 minutes) counselling sessions with occasional intensive interventions whenever possible. There is a dose-response effect for the number and length of counselling sessions.Evidence 6High Quality of Evidence (high confidence that we know true effects of the intervention). Stead LF, Buitrago D, Preciado N, Sanchez G, Hartmann-Boyce J, Lancaster T. Physician advice for smoking cessation. Cochrane Database Syst Rev. 2013 May 31;(5):CD000165. doi: 10.1002/14651858.CD000165.pub4. Review. PubMed PMID: 23728631. 2) Use motivational interviewing (motivationalinterviewing.org).Evidence 7Weak recommendation (benefits likely outweigh downsides, but the balance is close or uncertain; an alternative course of action may be better for some patients). Moderate Quality of Evidence (moderate confidence that we know true effects of the intervention). Quality of Evidence lowered due to potential reporting, publication bias, and moderate heterogeneity. Lindson-Hawley N, Thompson TP, Begh R. Motivational interviewing for smoking cessation. Cochrane Database Syst Rev. 2015 Mar 2;(3):CD006936. doi: 10.1002/14651858.CD006936.pub3. Review. PubMed PMID: 25726920. 3) Provide the patient with a combination of materials (self-help, web-based, individual, group, quitline). 4) Combine counselling and pharmacologic treatment.Evidence 8Strong recommendation (benefits clearly outweigh downsides; right action for all or almost all patients). High Quality of Evidence (high confidence that we know true effects of the intervention). Stead LF, Lancaster T. Combined pharmacotherapy and behavioural interventions for smoking cessation. Cochrane Database Syst Rev. 2012 Oct 17;10:CD008286. doi: 10.1002/14651858.CD008286.pub2. Review. Update in: Cochrane Database Syst Rev. 2016;3:CD008286. PubMed PMID: 23076944. Stead LF, Koilpillai P, Lancaster T. Additional behavioural support as an adjunct to pharmacotherapy for smoking cessation. Cochrane Database Syst Rev. 2015 Oct 12;(10):CD009670. doi: 10.1002/14651858.CD009670.pub3. Review. PubMed PMID: 26457723. 5) Suggest physical activityEvidence 9Weak recommendation (benefits likely outweigh downsides, but the balance is close or uncertain; an alternative course of action may be better for some patients). Low Quality of Evidence (low confidence that we know true effects of the intervention). Quality of Evidence lowered due to high risk of bias, high level of clinical heterogeneity, and inadequate sample size. Ussher MH, Taylor AH, Faulkner GE. Exercise interventions for smoking cessation. Cochrane Database Syst Rev. 2014 Aug 29;(8):CD002295. doi: 10.1002/14651858.CD002295.pub5. Review. PubMed PMID: 25170798. and a diet with ample fruit and fluidsEvidence 10Weak recommendation (benefits likely outweigh downsides, but the balance is close or uncertain; an alternative course of action may be better for some patients). Low Quality of Evidence (low confidence that we know true effects of the intervention). Quality of Evidence lowered as there is no experimental evidence and this is a personal opinion. to stay committed to the decision to quit. 6) Set a quit date if pharmacologic treatment is planned. In other cases, gradual reduction is a reasonable approach.Evidence 11Weak recommendation (benefits likely outweigh downsides, but the balance is close or uncertain; an alternative course of action may be better for some patients). Moderate Quality of Evidence (moderate confidence that we know true effects of the intervention). Quality of Evidence lowered due to imprecision. Lindson-Hawley N, Aveyard P, Hughes JR. Reduction versus abrupt cessation in smokers who want to quit. Cochrane Database Syst Rev. 2012 Nov 14;11:CD008033. doi: 10.1002/14651858.CD008033.pub3. Review. PubMed PMID: 23152252. 7) Advise the patient to get rid of cigarettes at home and to avoid smokers and situations that may trigger an urge to smoke. 8) Warn the patient that the first few weeks will be challenging. 5. Arrange follow-up visits or telephone calls to assess the quit plan (first contact within a week after the established quit date, second contact within the following month, and subsequent contacts as needed). At each visit: (1) if the attempt was successful, congratulate the patient and emphasize the need for total abstinence from smoking; (2) if the attempt was unsuccessful, encourage the patient by saying that relapses are common and even a short break from smoking is beneficial. Discuss the reasons for failure and prescribe medications or increase the dose of agents used in nicotine replacement therapy (NRT). Refer the patients to a smoking cessation clinic if available. Formulations, dosage, and principles for NRT: Table 5. Dosage of nonnicotine agents used in treatment of nicotine addiction: Table 6. Smokers willing to quit should be offered pharmacologic therapy to reduce cravings and maximize their chances of prolonged abstinence. 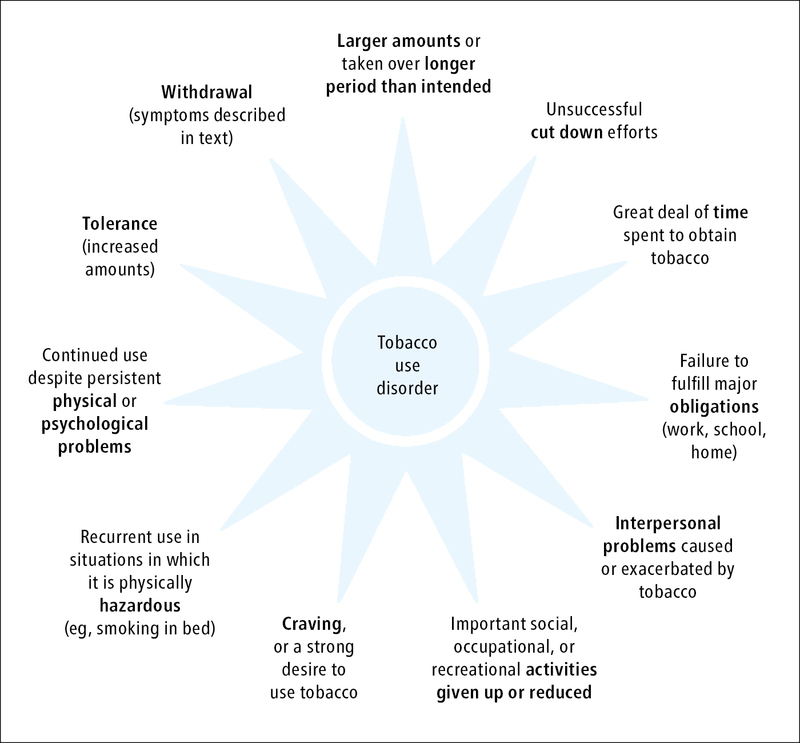 Pharmacotherapy interventions, including NRTs, bupropion (sustained release), varenicline, or cytisine—ideally in association with behavioral counselling—can increase the rate of tobacco abstinence in comparison to either used alone and are recommended.Evidence 12Strong recommendation (benefits clearly outweigh downsides; right action for all or almost all patients). High Quality of Evidence (high confidence that we know true effects of the intervention). Stead LF, Lancaster T. Combined pharmacotherapy and behavioural interventions for smoking cessation. Cochrane Database Syst Rev. 2012 Oct 17;10:CD008286. doi: 10.1002/14651858.CD008286.pub2. Review. Update in: Cochrane Database Syst Rev. 2016;3:CD008286. PubMed PMID: 23076944. Stead LF, Koilpillai P, Lancaster T. Additional behavioural support as an adjunct to pharmacotherapy for smoking cessation. Cochrane Database Syst Rev. 2015 Oct 12;(10):CD009670. doi: 10.1002/14651858.CD009670.pub3. Review. PubMed PMID: 26457723. 1. NRTs are recommended for smoking cessation.Evidence 13Strong recommendation (benefits clearly outweigh downsides; right action for all or almost all patients). High Quality of Evidence (high confidence that we know true effects of the intervention). Stead LF, Perera R, Bullen C, et al. Nicotine replacement therapy for smoking cessation. Cochrane Database Syst Rev. 2012 Nov 14;11:CD000146. doi: 10.1002/14651858.CD000146.pub4. Review. PubMed PMID: 23152200. Replacement therapies reduce cravings induced by abstinence or reduction and increase the rate of abstinence across different populations (patients with chronic obstructive lung disease, patients with psychiatric disorders, African Americans). Combined use of short-acting (gum, lozenges, inhalers) and long-acting (patches) NRT is more effective than monotherapy.Evidence 14High Quality of Evidence (high confidence that we know true effects of the intervention). Stead LF, Perera R, Bullen C, et al. Nicotine replacement therapy for smoking cessation. Cochrane Database Syst Rev. 2012 Nov 14;11:CD000146. doi: 10.1002/14651858.CD000146.pub4. Review. PubMed PMID: 23152200. Contrary to the popular belief, smoking while on NRT does not appear to be harmful, and NRT can be used as part of the “reduce-to-quit” strategy. However, we suggest using NRT with caution in patients with unstable angina, recent myocardial infarction, or life-threatening arrhythmia. Replacement therapy should be matched to current nicotine consumption, considering that 1 cigarette equals 1-2 mg of nicotine. The dose can then be adjusted according to the frequency of cravings or adverse effects from nicotine overdose: hiccups, xerostomia, dyspepsia, nausea, heartburn, tachycardia, or sleep disorders. Temporomandibular articular pain from gum chewing can be relieved by intermittent chewing and parking the gum between the jaw and the cheek. Skin reaction from the patch is frequent and tends to attenuate after a few weeks of usage. 2. Sustained-release bupropion reduces nicotine reinforcement and cravings by blocking reuptake of dopamine and noradrenaline. We suggest it in smokers in the preparation phase with a set quit date.Evidence 15Weak recommendation (benefits likely outweigh downsides, but the balance is close or uncertain; an alternative course of action may be better for some patients). High Quality of Evidence (high confidence that we know true effects of the intervention). Hughes JR, Stead LF, Hartmann-Boyce J, Cahill K, Lancaster T. Antidepressants for smoking cessation. Cochrane Database Syst Rev. 2014 Jan 8;(1):CD000031. doi: 10.1002/14651858.CD000031.pub4. Review. PubMed PMID: 24402784. It may be preferred in patients with depressive symptoms or patients worried about weight gain. The main contraindications to the use of bupropion are a past history of seizures of any etiology, head trauma, and eating disorders. The rate of de novo seizures is low (<0.5%) and generally associated with doses >450 mg. In the course of bupropion therapy, alcohol may be consumed in moderate amounts and not discontinued abruptly, as withdrawal-related seizure risk is increased. The other adverse reactions include insomnia, agitation, dry mouth, changes in behavior, hostility, agitation, depressed mood, suicidal ideations, and suicidal attempts. 3. Varenicline is a synthetic nicotinic receptor partial agonist that binds to receptors with a greater affinity than nicotine. Like bupropion, we suggest to use it for the first intention in motivated patients with a set quit date or in patients who have failed NRT alone.Evidence 16Weak recommendation (benefits likely outweigh downsides, but the balance is close or uncertain; an alternative course of action may be better for some patients). High Quality of Evidence (high confidence that we know true effects of the intervention). Jorenby DE, Hays JT, Rigotti NA, et al; Varenicline Phase 3 Study Group. Efficacy of varenicline, an alpha4beta2 nicotinic acetylcholine receptor partial agonist, vs placebo or sustained-release bupropion for smoking cessation: a randomized controlled trial. JAMA. 2006 Jul 5;296(1):56-63. Erratum in: JAMA. 2006 Sep 20;296(11):1355. PubMed PMID: 16820547. Gonzales D, Rennard SI, Nides M, et al; Varenicline Phase 3 Study Group. Varenicline, an alpha4beta2 nicotinic acetylcholine receptor partial agonist, vs sustained-release bupropion and placebo for smoking cessation: a randomized controlled trial. JAMA. 2006 Jul 5;296(1):47-55. PubMed PMID: 16820546. Tonstad S, Tønnesen P, Hajek P, Williams KE, Billing CB, Reeves KR; Varenicline Phase 3 Study Group. Effect of maintenance therapy with varenicline on smoking cessation: a randomized controlled trial. JAMA. 2006 Jul 5;296(1):64-71. PubMed PMID: 16820548. Cahill K, Lindson-Hawley N, Thomas KH, Fanshawe TR, Lancaster T. Nicotine receptor partial agonists for smoking cessation. Cochrane Database Syst Rev. 2016 May 9;(5):CD006103. doi: 10.1002/14651858.CD006103.pub7. Review. PubMed PMID: 27158893. Contraindications include pregnancy and end-stage renal failure. Although major studies have not demonstrated an increase in neuropsychiatric adverse events, mood disorders are more prevalent in smokers. Thus, we recommend to assess mood in all smokers with a simple questionnaire and use varenicline with caution in patients with psychiatric disorders. (For a sample questionnaire, you may consult: Perlman et al, Suicide Risk Assessment Guide A Resource for Health Care Organizations.) The most common adverse effects include moderate nausea that resolves in the course of treatment, abnormal dreams, insomnia, and headache. 4. Cytisine is a natural alkaloid and a nicotinic receptor partial agonist with a documented efficacy equivalent to NRT in healthy individuals. It is currently unavailable in North America, but it is available in some parts of Europe, and its low cost makes it an attractive choice when compared with other pharmacologic options.Evidence 17Weak recommendation (benefits likely outweigh downsides, but the balance is close or uncertain; an alternative course of action may be better for some patients). Moderate Quality of Evidence (moderate confidence that we know true effects of the intervention). Quality of Evidence lowered due to imprecision. Walker N, Howe C, Glover M, et al. Cytisine versus nicotine for smoking cessation. N Engl J Med. 2014 Dec 18;371(25):2353-62. doi: 10.1056/NEJMoa1407764. PubMed PMID: 25517706. Cahill K, Lindson-Hawley N, Thomas KH, Fanshawe TR, Lancaster T. Nicotine receptor partial agonists for smoking cessation. Cochrane Database Syst Rev. 2016 May 9;(5):CD006103. doi: 10.1002/14651858.CD006103.pub7. Review. PubMed PMID: 27158893. Contraindications include hypersensitivity to cytisine, hypertension, pregnancy, and breastfeeding. Use cystine with caution in patients with advanced atherosclerosis or active peptic ulcer disease. Adverse effects include nausea, vomiting, pyrosis, xerostomia, pupil dilation, tachycardia, hypertension, fatigue, and malaise. Concerns have been raised regarding the safety of smoking cessation medications for patients with cardiovascular disease. Although caution is advised in patients with acute or severe coronary disease, the benefits of smoking cession generally outweigh the cardiac risks of bupropion or varenicline. NRT was associated with an increase in minor cardiovascular events such as tachycardia and arrhythmia but it does not increase the risk of major adverse cardiac events. Although the risks and benefits of these therapies should be adequately weighted in patients with acute or severe cardiac conditions, most patients risk more from continued tobacco use than from the medication. Cigarette smoking during pregnancy and early infancy is associated with multiple negative effects including low birth weight, increased preterm labor and pregnancy loss, sudden infant death syndrome, and childhood respiratory illnesses. Thus, all pregnant women should be advised to stop smoking and make their environment smoke-free.Evidence 18Weak recommendation (benefits likely outweigh downsides, but the balance is close or uncertain; an alternative course of action may be better for some patients). Low Quality of Evidence (low confidence that we know true effects of the intervention). Quality of Evidence lowered as it is an expert opinion based on generalization from other populations. Because of conflicting evidence of congenital defects associated with NRT, counselling should be considered the first line of therapy for smoking cessation in pregnant patients. NRT with gums or lozenges may be considered as a second line of therapy rather than continuous transcutaneous nicotine. In the last years, electronic nicotine delivery systems (ENDSs) have provided smokers with a new and attractive option to assist smoking cessation. ENDSs may be helpful in a harm-reduction strategy, but the evidence supporting their use is limited and their regulation needs to be strengthened to ensure public safety.Evidence 19Weak recommendation (benefits likely outweigh downsides, but the balance is close or uncertain; an alternative course of action may be better for some patients). Moderate Quality of Evidence (moderate confidence that we know true effects of the intervention). Quality of Evidence lowered due to heterogeneity (variability in devices used) and imprecision (small number of events). McRobbie H, Bullen C, Hartmann-Boyce J, Hajek P. Electronic cigarettes for smoking cessation and reduction. Cochrane Database Syst Rev. 2014;(12):CD010216. doi: 10.1002/14651858.CD010216.pub2. Review. PubMed PMID: 25515689. Lam C, West A. Are electronic nicotine delivery systems an effective smoking cessation tool? Can J Respir Ther. 2015 Fall;51(4):93-8. Review. 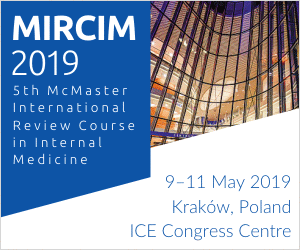 PubMed PMID: 26566380; PubMed Central PMCID: PMC4631136. Kalkhoran S, Glantz SA. E-cigarettes and smoking cessation in real-world and clinical settings: a systematic review and meta-analysis. Lancet Respir Med. 2016 Feb;4(2):116-28. doi: 10.1016/S2213-2600(15)00521-4. Review. PubMed PMID: 26776875; PubMed Central PMCID: PMC4752870. 1 Synergistic interaction with alcohol use. Adapted from: Vineis P, Alavanja M, Buffler P, et al. Tobacco and cancer: recent epidemiological evidence. J Natl Cancer Inst. 2004 Jan 21;96(2):99-106. 2. Do you find it difficult to refrain from smoking in places where smoking is forbidden (eg, in church, at the library, in cinema)? 4. How many cigarettes a day do you smoke? 6. Do you smoke if you are so ill that you are in bed most of the day? Source: Heatherton TF, Kozlowski LT, Frecker RC, Fagerström KO. The Fagerström Test for Nicotine Dependence: a revision of the Fagerström Tolerance Questionnaire. Br J Addict. 1991 Sep;86(9):1119-27. Based on: Prochaska JO, Goldstein MG. Process of smoking cessation. Implications for clinicians. Clin Chest Med. 1991 Dec;12(4):727-35.
bid, 2 times a day. Figure 1. Criteria defining tobacco use disorder. Figure 2. 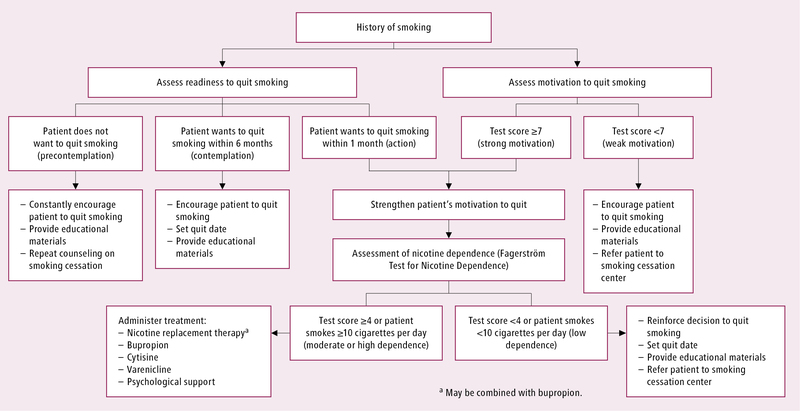 Smoking cessation algorithm.